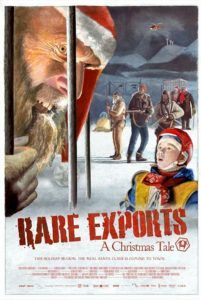 Rare Exports: A Christmas Tale reminds me of running downstairs on Christmas morning to spy a massive gift under the tree, the three-foot-high box shimmering with glossy wrapping paper and topped with a whirly bow, the package oh-so full of promise. Anything could be in there, and something in a box like this must be good. Except, when you tear off the paper and open the box, you find only a Target gift card inside. All that effort for a gift card? Finnish writer-director Jalmari Helander’s film promises much with its setup: a mildly comic, bloody story about where Santa Claus really comes from. Subtly parodying those 1980s Hallmark Christmas movies like The Night They Saved Christmas, Helander mixes a dash of holiday spirit with Grimm fairy tale horror. And although it has a lot of imagination, the lopsided outcome never balances its elements in a satisfying way—except as a lark—no matter how admirably weird it may be. Helander, a successful commercial director in his Helinski homeland, made two short films (Rare Exports, Inc. and Rare Exports, Inc.: Safety Instructions) about wild Santa Clauses being captured and tamed for distribution the world over (this could be construed as a spoiler; the spoiling only gets worse—be warned). As such, this film is a prequel of sorts, following the discovery of said Santas in Finland’s Korvatunturi Mountains. So restrained in its satire that some may miss the humor, the film follows young boy Pietari (Onni Tommila), who lives with his father, Rauno (Jorma Tommila), a butcher who hacks up reindeer for his village. (Reindeer are a typical food source in Finland, but nevertheless it’s creepy to see dead reindeer in a Christmasy movie.) Atop a nearby mountain, Americans (who else) blast to uncover a secret, and not unlike the scientists in The Thing they discover something terrible. What they discover is a horned, Del Toro-esque Santa creature buried in the ice; later we see it imprisoned in a dripping block, locked away in a warehouse waiting to thaw. Its goal: punish wayward little children. Along with monster-Santa come his “elves”, minions brainwashed into executing Santa’s instructions with a vengeance. Instead of little people in jolly green and red getups, this Santa’s elves are naked old men carrying a variety of killing tools. When they’re unearthed by a man bent on finding the original Santa, he warns his crew no cussing, no bad behavior, be nice… or else. Of course, they don’t listen and they’re added to the film’s rather modest body count. But I’m getting ahead of myself. Before you see any of these twisted holiday horrors, Helander spends plenty of time with Pietari, an awkward, quiet, and precocious child straight out Spielbergian fare. After doing some considerable home research on local Santa lore (Where does he get these university-worthy volumes on Santa’s history? ), which reveals a monstrous Santa-beast boiling children on his Naughty List, Pietari resolves to protect himself as Christmas morning approaches. Layered in plastic padding and some spank-resistant cardboard taped to his bottom, Pietari carries a firearm much to his dad’s obliviousness. It should be mentioned that Helander’s Finnish village contains no women; Pietari’s mother is dead, but where are the other mothers? In all likelihood, Helander chose to omit a genre device (the nagging mother, annoying sister, etc.) for the sake of his audience, and to preserve his moody tone. At any rate, on Christmas morning Pietari’s father discovers that a naked-old-man-elf has fallen into his wolf trap and, after deciding to get rid of the body by chopping it up (Merry Christmas! ), finds the man is still alive. By the time Pietari and his father have uncovered the truth about Christmas, and Pietari is barking out orders like some action hero who’s dealt with this situation dozens of times before, Helander’s shifts in tone have taken us in too many directions to reconcile on any level other than lampoonery. Then comes the optimistic conclusion—an at once cheery and ominous sequence reflecting Helander’s short films, where these villagers send out reformed Santa-elves (garbed in red and white Santa costumes) across the world in wooden crates. 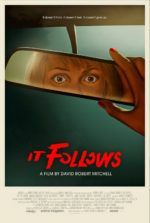 The humorous shorts and the film’s last twenty minutes never quite align with the film’s eerie first two-thirds, which are steadily paced and filled with slasher sensibilities (maybe not enough). Worst of all, in the end, we’re robbed of seeing Santa as a big monster with horns (at least, not thawed from his block of ice). For shame, there’s not even a momentary glance at the baddie. Maybe my aversion to the material lies in expectation: the whole beginning builds (or seems to anyway) to Santa’s grizzly emergence in the end, but instead there’s an explosion which robs us of that thrill. 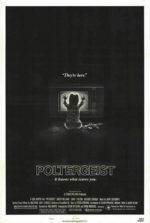 Regardless, cult audiences and college goons should eat up Rare Exports for its offbeat mannerisms, forgiving its tonal inconsistencies for its bizarro storyline. Helander’s assured visual style, courtesy of gorgeously filmed scenery lensed by Mika Orasmaa, makes the backdrop picturesque and better looking than this film has any right to be. Too, the special effects are top-notch, with the exception of an old-man-elf horde swarming over the landscape in CGI ugliness. 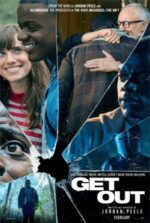 From a distance the film is admirable, just too unfocused to allow oneself to get involved as much as, say, Attack the Block—another film that brings unexpected genre elements together, but in a richly satisfying way.